VersaLASER platform series processes multiple materials and diverse applications with speed, detail and accuracy. 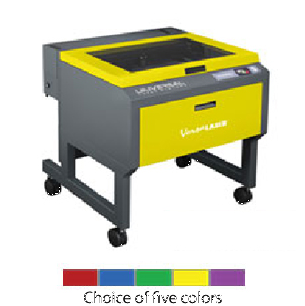 Available in three platform sizes, the VersaLASER VLS3.60, VLS4.60 and VLS6.60 deliver laser power up to 60 watts with a work area up to 32x18in (813x457mm). The VersaLASER systems utilize Universal’s patented Rapid Reconfiguration™ technology, which enables customers to change laser power within seconds and without tools. The VersaLASER platform series is designed with seamless integration of Universal’s CO2 laser, laser system and advanced Laser Interface+™ materials-based Windows print driver that optimizes the customer’s workflow process, improves operation efficiencies and expands customized application offerings. VersaLASER platform series processes multiple materials and diverse applications with speed, detail and accuracy. Available in three platform sizes, the VersaLASER VLS3.60, VLS4.60 and VLS6.60 deliver laser power up to 60 watts with a work area up to 32x18in (813x457mm). The VersaLASER systems utilize Universal’s patented Rapid Reconfiguration™ technology, which enables customers to change laser power within seconds and without tools. The VersaLASER platform series is designed with seamless integration of Universal’s CO2 laser, laser system and advanced Laser Interface+™ materials-based Windows print driver that optimizes the customer’s workflow process, improves operation efficiencies and expands customized application offerings.